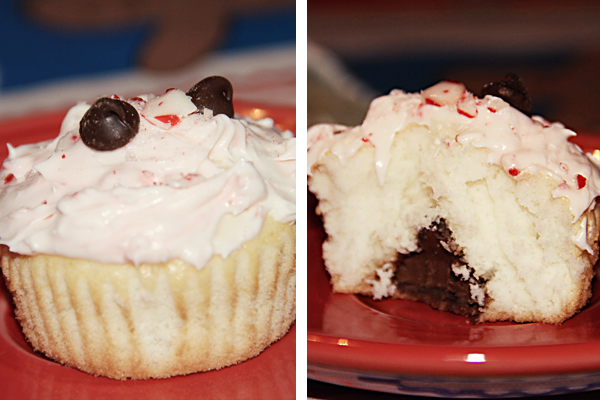 LaLa Little Lovebird: Candy Cane Surprise Cupcakes! *optional* chocolate chips for on the top of the cupcakes. Step number one (and a very important one at that) is to turn on some good tunes. First you'll need to mix up your cake mix as instructed on the box. Put your cupcake papers in the cupcake tin and spoon only enough of your batter into each space to cover the bottoms of your papers. Pop them in the oven and onto the next step we go. This part is fun, especially when you need to relieve some stress, just don't make these when people are sleeping, this part is a bit loud. 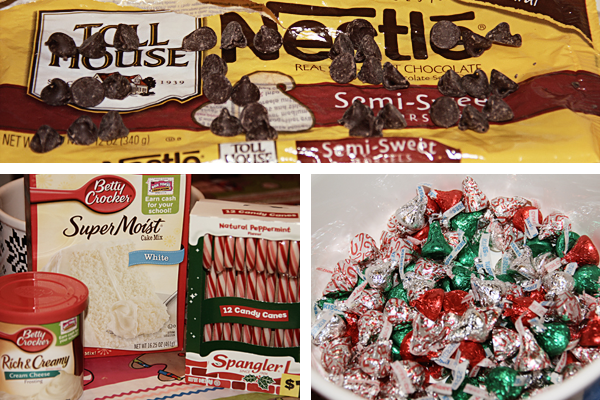 You need to put about six candy canes in a bag and smash them up as fine as you can. I didn't smash them all up as much as I should have but I now know for next time. You aren't going to use all of the smashed up candy canes for the next part so leave at least a third of them out of this step. 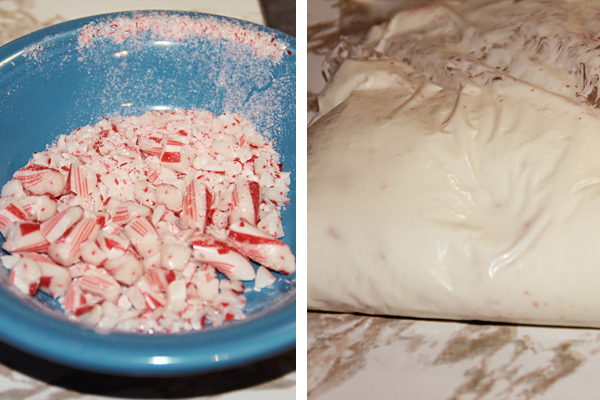 You now want to take your icing and put it in a ziploc bag then toss the 2/3 of the smashed up candy canes into it. Make sure the bag is sealed and mush it around a bunch to get it mixed well. I had to do the cake baking process and everything minus the icing and candy canes twice, due to the fact my cupcake tin only was a 12 cupcake tin. Boxed cake mix will make 24 cupcakes. 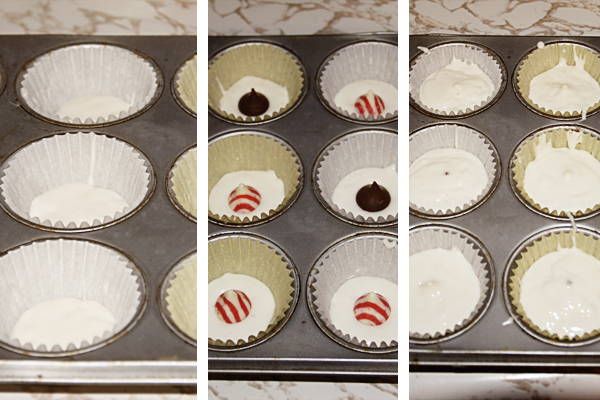 When that is all done wait for the cupcakes to cool then apply the icing. The left over crushed candy canes/candy cane dust will be dumped onto the cupcakes and the optional chocolate chips will go on the cupcakes for decoration. Well, you're making us "non-bakers" look pretty bad, but these look awesome! And those candy cane kisses are my absolute favorite. I have a big jar on my desk as we speak. I will never tell you how many I've eaten today. You can't really tell the bowl size, but the bowl that all of my kisses are in is pretty huge haha. I'm not a real baker haha, if I was I'd do it all from scratch but I have zero patience for that. And I don't usually attempt to make any of the ideas that pop into my head but this time I'm glad I did! BRILLIANT!!! I love this idea and might just have to steal it. I haven't even started my Christmas baking yet. I think this is a great treat to add to the list. Please do! I'd love for others to "steal" the idea haha. I just want to warn you though, they don't last as long as you'd think. I think they were gone in about three days here. Then again that's generally how baked goods go around here anyway.